Supreme Court Strikes Down Key Provision Of Voting Rights Law : The Two-Way While the decision does not do away with the landmark law entirely, it rendered an enforcement mechanism moot unless Congress acts. By a 5-4 decision, the Supreme Court has struck down a key provision of the landmark 1965 Voting Rights Act that establishes a formula to identify states that may require extra scrutiny by the Justice Department regarding voting procedures. The decision focuses on Section 4 of the Act. Writing for the majority, Chief Justice John Roberts writes that the decision "in no way affects the permanent, nationwide ban on racial discrimination in voting found in [Section] 2. We issue no holding on [Section] 5 itself, only on the coverage formula. Congress may draft another formula based on current conditions." Legal scholar Jeffrey Toobin tells CNN that the court has effectively said "times have changed so much that the formula [for deciding which states are more prone to discriminate] is invalid." And by striking Section 4, he said, "in practice, the other section of the law – Section 5 — is dormant." As the AP explains it, the Supreme Court has essentially decided that Section 5 of the act — the part that requires certain states with a history of discrimination to have changes to any voting procedures approved by the federal government — cannot be enforced until Congress "comes up with a new way of determining which states and localities require federal monitoring of elections." The case, known as Shelby County v. Holder, focused on Section 5 of the act, which was renewed by Congress in 2006 for a period of 25 years. The petitioner, Shelby County, Ala., argued that Section 5 of the VRA subjects them to a double standard and infringes on state sovereignty. Specifically, the plaintiff argued that Congress exceeded its authority under the Fourteenth Amendment guaranteeing equal protection and the Fifteenth Amendment covering voting rights and therefore violated the Tenth Amendment and Article IV of the constitution – both of which deal with state's rights. Attorney General Eric Holder had argued that the restrictions, which cover nine southern states including Alabama and numerous counties in five other states, were necessary to keep them from returning to discriminatory practices. Citing today's Supreme Court decision, Texas Attorney General Greg Abbott said there is nothing to block the state from activating its controversial voter ID law. The Dallas Morning News reports that the Texas Department of Public Safety said beginning Thursday voters will be required to show photo ID to vote in the state. The attorney general also said that redistricting maps "passed by the Legislature may also take effect without approval from the federal government." Attorney General Eric Holder said that the Justice Department will continue to carefully monitor states "for voting changes that may hamper voting rights." Holder said that while the country has changed "for the better since 1965," the "destination we seek has not yet been reached." Holder took the position Ginsburg presented in her dissent — that the Constitution gives Congress explicit authority to legislate on matters concerning the fundamental right to vote. "As the President has made clear, Congress needs to act to make sure every American has equal access to the polls. The Department also will work with Congress and other elected and community leaders to formulate potential legislative proposals to address voting rights discrimination – because, on their own, existing statutes cannot totally fill the void left by today's Supreme Court ruling. And I am hopeful that new protections can and will pass in this session of Congress. "The Voting Rights Act has always had strong bipartisan support on Capitol Hill, and today's ruling should not change that. This is not a partisan issue, it's an American issue – because our democracy is founded on ensuring that every eligible citizen has access to the ballot box." President Obama said he was "deeply disappointed" with the decision the Supreme Court handed down today. He said the decision "upsets decades of well-established practices that help make sure voting is fair, especially in places where voting discrimination has been historically prevalent." Obama also called on Congress to pass a new law that sets up a new formula for determining which states need extra federal supervision. "This is a sign of tremendous racial progress. And Congress, if it decides to look into this, needs to take account of that and go into this with, at best a scalpel and not a hatchet, as it did based on conditions that existed back in 1972 that fortunately no longer exist today." Spencer Overton, a professor of law at George Washington University who served in the Obama administration's Justice Department, emphasized that from here on out transparency wil be key. He said that areas with significant minority populations should be required to disclose any election changes. "Transparency deters bad activity," he said. "And the big plus of Section 5 was that these local officials knew that their actions would be reviewed and as a result, there was deterrence of a lot of bad activity and disclosure can help with a lot of that deterrence." In a statement, Wade Henderson, president and CEO of The Leadership Conference on Civil and Human Rights, called today's decision a "setback to our democracy and the voting rights of real Americans." "We can't allow discrimination at the ballot box and must prevent minorities from having their votes purged, packed, gerrymandered, and redistricted away. No one should be fooled by the Pollyannaish fantasy that voting discrimination no longer exists . As the Court acknowledged, voting discrimination still exists and Congress may draft another coverage formula. We urge Congress to act with urgency and on a bipartisan basis to protect voting rights for minorities." NPR's Nina Totenberg tells Morning Edition that Section 5 of the VRA is perhaps its most successful provision. It stated that areas that discriminated against minorities must have any changes to voting procedures approved by the federal government before they go into effect. The areas covered by that provision were determined by a "coverage formula" that was last updated in 1972. Nina says the majority said some states were "being forced to endure current burdens based on old conditions." Chief Justice Roberts pointed to Mississippi: In 1965, only 7 percent of African Americans voted. In 2004, 76 percent of African Americans voted. He said that success meant that the formulas were no longer valid. Justice Ruth Bader Ginsburg wrote the dissenting opinion joined by Justice Stephen Breyer, Justice Sonia Sotomayor and Justice Elena Kagan. Essentially, Ginsburg argued that under the Fifteenth Amendment, it was Congress' job — not the Court's — to decide when Section 5 of the Voting Rights Act is no longer justifiable. "With overwhelming support in both Houses, Congress concluded that, for two prime reasons, [Section 5] should continue in force, unabated," Ginsburg writes. "First, continuance would facilitate completion of the impressive gains thus far made; and second, continuance would guard against back­ sliding. Those assessments were well within Congress' province to make and should elicit this Court's unstinting approbation." 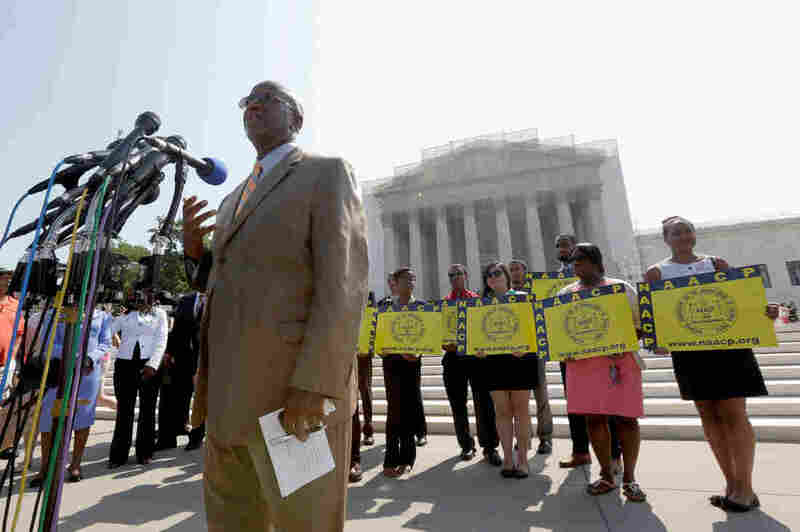 On Morning Edition, NPR's Carrie Johnson explains that the court focused in on the formula that determines which states and districts have a history of discrimination. That formula, the court said, was based on "outdated data" from the 1960s and 1970s, so Congress needs to rework it. Justice Clarence Thomas delivered a concurring opinion, except, he said, he would have also done away with Section 5. "By leaving the inevitable conclusion unstated, the Court needlessly prolongs the demise of that provision. For the reasons stated in the Court's opinion, I would find [Section 5] unconstitutional."